Stunning chromolithograph panorama showing Mt. Fuji. An absolutely stunning and rare panoramic view of the Tokaido region, Japan dating to Taisho 15 or 1926. Tokaido was originally an old Japanese geographical region that made up the gokishichido system and was situated along the southeastern edge of Honshu. Its name literally means 'Eastern Sea Way.' The map beautifully depicts Mt. Fuji along with important cities along the way, including Hakone, Atami, Izu, Kamakua, Shizuoka, the Mirua Peninsula, etc. Today it generally refers to the populous region between Tokyo and Makinohara, including Shimoda, Ito, Izu, Yokosuka, Yokohama and Mt. Fuji. This view also includes two inset maps. At 3, 775 Meters, Mount Fuji is the highest mountain in Japan and is considered to be one of the archipelago's Three Holy Mountains. Mount Fuji's exceptionally symmetrical cone is a well-known symbol of Japan and it is frequently depicted in art and photographs, as well as visited by sightseers and climbers. 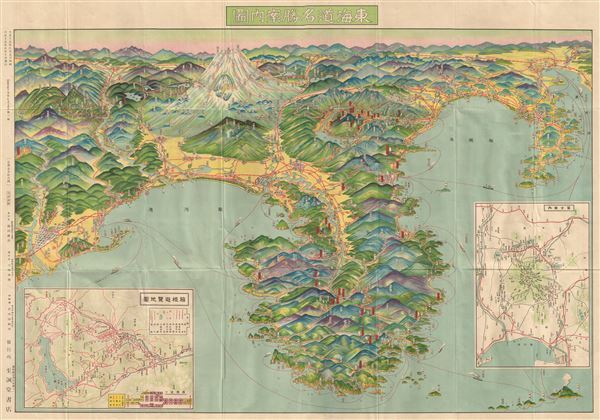 This uncommon type of map evolved from the exposure of traditional Japanese view-style cartography to western technology. Views like this began to appear in Japan, Taiwan, and Korea in the early 20th century. Generally speaking such maps coincided with the development of railroad lines throughout the once vast Dai Nippon Teikoku or Japanese empire. It is a distinctive style full of artistic flourish that at the same time performs a practical function. This particular example is both relatively early and exceptionally beautiful. It was printed via a multi-color chromolithographic process with delicately shaded tones and an easily comprehensible intuitive design. Very good. Minor wear along original fold lines. Minor verso repair over right inset map. Comes with original binder. Text and guide on verso.